A proposal to create a reward system to encourage students to attend wellness events on campus was the winner of a campus-wide Wellness Case Competition that concluded April 5 at the second annual UConn Alcohol and Other Drugs (AOD) Stakeholders Call to Action Program. The UConn AOD Coalition was created last year by the Department of Student Health and Wellness to implement strategies to help support life-long learning and well-being for all UConn students. This year, the AOD teamed up with the OPIM Innovate program in the School of Business to sponsor the Wellness Case Competition. OPIM Innovate gives students, faculty, and staff hands-on experience with emerging technologies. In this competition, students were challenged to develop ideas to create a continuum of connectedness and engagement on campus to support student well-being. The three groups of finalists in the competition presented their ideas Friday at the Alumni Center, wrapping up a day of speakers on mental health and substance abuse. The winning presentation was “Wellness Points” – which would offer points to UConn students for attending various wellness programs on campus. There would be bonus points for consistent behaviors, and students would be able to redeem their points for such items as t-shirts and water bottles. 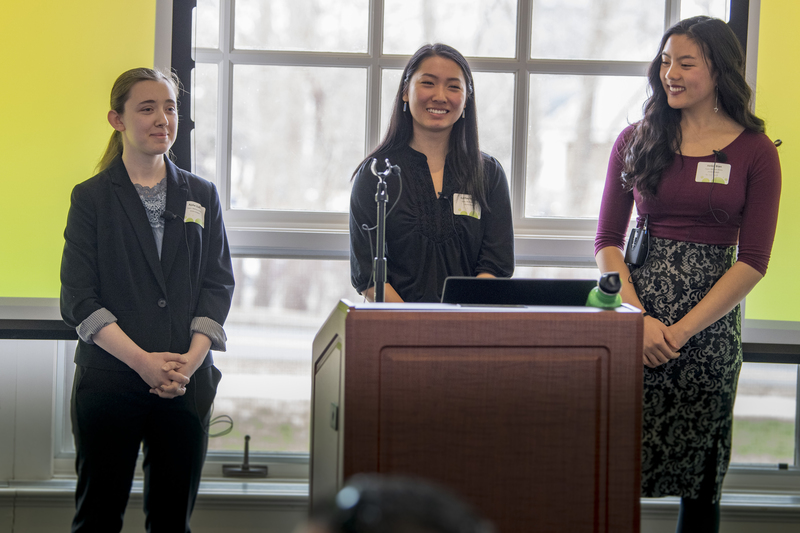 The presenters of this concept were sophomore Helen Bian of Cheshire, Connecticut, sophomore Catherine Qiu of Trumbull, Connecticut, and sophomore Ajshe Zulfi of Trumbull, Connecticut. Qiu said that she looked at statistics put out by AOD and realized that she was part of the majority of college students who don’t get proper nutrition or sufficient sleep and exercise. The winning team will work with the university to develop the winning idea for implementation. The students see their idea as similar to the Husky Health Challenge, a student-run program offered through Student Health Services, which used an app to track attendance. That program is no longer available. “The Sunshine Initiative” – a proposal to install benches, picnic tables, and swing trees in high traffic areas on campus, in order to create community feeling and reduce stress. That group included junior Mar Amador of Wethersfield, Connecticut, senior Julianne Longman of Newton, Massachusetts, and sophomore Sarah Soucy of East Granby, Connecticut. “Team Pawsitivity” – a proposal to have traveling pet therapy on campus. That group included junior Amy Chen of Woodbridge, Connecticut, sophomore Natalie Roach of Cheshire, Connecticut, and senior Roddy Tang of Savage, Minnesota.